Fotis, J., Buhalis, D. and Rossides, N., 2012. 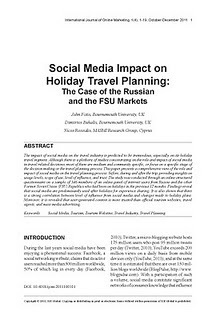 Social media impact on holiday travel planning: The case of the Russian and the FSU markets. In El-Gohary H., ed. Transdisciplinary Marketing Concepts and Emergent Methods for Virtual Environments. Hershey, PA: Business Science Reference, 230-249. Fotis, J., Buhalis, D. and Rossides, N., 2012. 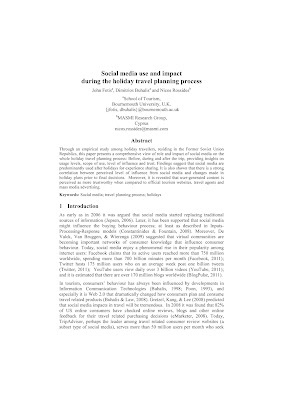 Social Media Use and Impact during the Holiday Travel Planning Process. In Fuchs, M., Ricci, F. and Cantoni, L., eds. Information and Communication Technologies in Tourism 2012. Vienna, Austria: Springer Verlag, 13-24. Fotis, J., Buhalis, D. and Rossides, N., 2011. 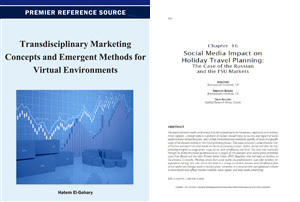 Social media impact on holiday travel planning: The case of the Russian and the FSU markets. International Journal of Online Marketing, 1(4), 1-19. Fotis, J., Rossides, N. and Buhalis, D., 2010. Social Media Impact on Leisure Travel: The Case of the Russian Market and the Challenges for the Cyprus Tourism Industry. In Vrontis, D., Weber, Y., Kaufmann, R. and Tarba, S., eds. 3rd Annual EuroMed Conference of the EuroMed Academy of Business: Business Developments Across Countries And Cultures. Nicosia: EuroMed Press,1365-1367.